A slow digesting protein thats ideal between meals and before bed. Casein protein comes from cows milk like whey protein does. 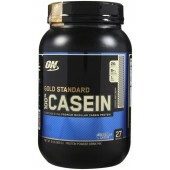 Where whey protein is faster digesting, Casein does something special where it gels as it reaches your stomach acid. Which causes casein to digest much slower and gives your body a constant supply of rich amino acids & essential amino acids. This makes it ideal for between meals and as a late night / before bed protein so you can fuel your body all day and night and also makes you feel less hungry.